If you love country, there’s only one place for you to be on Friday 14th June 2019!! 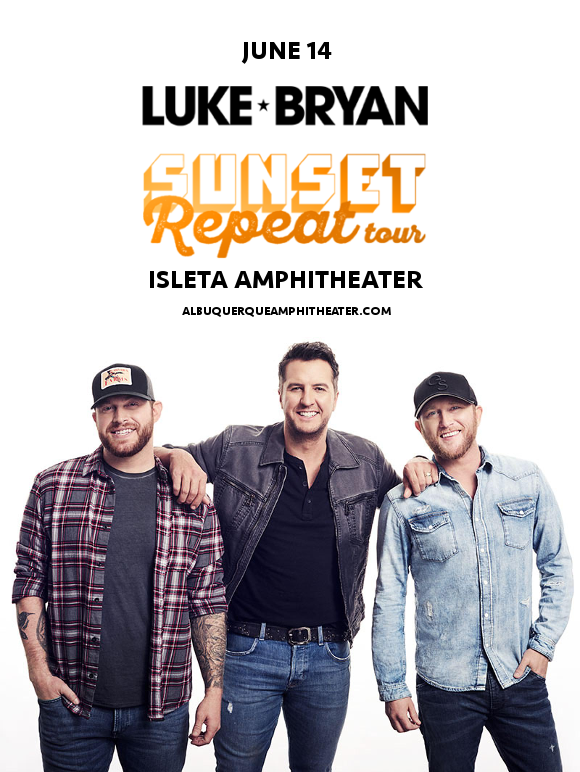 That’s right Luke Bryan embarks on the Sunset Repeat Tour this year, with support from special guests Cole Swindell and Jon Langston. Catch them LIVE at the Isleta Amphitheater – tickets on sale NOW and guaranteed to disappear quickly, so be quicker and get ‘em while you can!! With more than seven million albums and 27 million singles sold around the world, Luke Bryan is not just one of the biggest country starts, but most successful musicians on the planet right now! And its not hard to see why – having written for artists including Travis Scott and Billy Idol before launching his phenomenally successful solo career, Luke Bryan showed over the course of his 10-album strong repertoire just how to perfectly walk the line between pure country and radio-friendly pop, sweeping up fans from both sides as he went. His most recent album, “What Makes You Country,” is a reflection on the nature of, and the responses to, his mixed-genre work across the years, as well as bringing in a look at fatherhood with the inclusion of his two sons in a music video. Well, what are you waiting for?? Don’t miss this chance to catch three incredible country artists live in one fantastic concert – grab your tickets to see Luke Bryan, Cole Swindell, and Jon Landston NOW while they last! !